Marthélize Tredoux: SA wine needs a fair price both here and abroad but is it possible? I can’t resist jumping on a good bandwagon, so let me jump on this recent one with gleeful abandon: A bargain wine from a mystery producer raked in a bucket full of awards at the Old Mutual Trophy Wine Show causing many wine snobs to wrinkle their noses in disgust. Walking away as the most decorated wine of the show, the Secret Cellars Chenin Blanc No. 235 2015 claimed the Harold Eedes trophy for best in class, the International Judges’ trophy (highest scoring trophy on the international judges’ ballots) as well as the Old Mutual Discovery of the Show trophy for best value gold medal winner. That’s a load of silverware. And the wine is R35 a bottle, distributed by Ultra Liquors and nobody even knows who the producer was. Cue a dizzying storm of outrage among the connoisseurs, confusion among the bourgeoisie and would-you-look-at-that snorts from the champions of cheap and cheerful wines. If you’re under the impression that it’s not such a big deal, perhaps you haven’t been talking to many wine people. Since the winners were announced last, some or other aspect of this surprise result keeps arising on Facebook or Twitter on an almost daily basis. People are definitely talking and it’s got me reflecting on the pricing issue again. 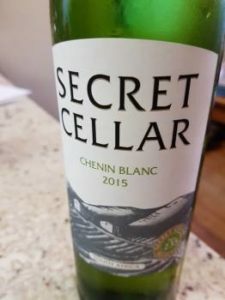 I haven’t had this particular Secret Cellars yet (but I suffer severe wine FOMO so you can be sure that I’ll be getting myself a little sample soon) so I can’t comment on the wine. But I think we can all acknowledge the buzz isn’t really about what’s in the bottle (no offence, Ultra Liquors). I’m sure it’s a great little number. It’s just very nearly irrelevant. You see, our industry is perpetually embroiled in this problem with pricing. And I think part of that problem is because we want to please everyone. Let’s unpack that. It’s generally agreed that, on average, South African wine punches well above its weight in terms of great value per ZAR. This is both an advantage and a hindrance in international markets: If consumers have already tasted our wines, they know they are hard pressed to find better quality wines at the prices our labels come in at – at any tier. Excellent wines + sucky exchange rate = wine buyer bonanza. The downside is that if our overseas brethren aren’t familiar with the quality of our offerings, the dangerous assumption of “cheap and cheerful” at best or “cheap and nasty” at worst is made, and we lose out. This is all sound thinking. The problem is the reaction when the same principle gets applied on home turf. Mention raising local wine prices and you will be met with weeping and gnashing of teeth. I’m very guilty when it comes to this – on the work side I’ve got my eyes on the US, feeling incredulous that our best wines sell for significantly less than their international counterparts. But when the work day is done, I walk into my favourite wine shop and pick out a few favourites and despair when a couple of bottles add up to too many digits. The cognitive dissonance here is problematic. We want people with USD, Euros and GBP to pay more for our wines. And they should. At the same time, we don’t want to upset our (rather spoilt) local consumer base by confronting them with more realistic prices. Maybe we’re afraid that they’ll cheat on us with brandy and coke, so we want to keep everyone happy. I don’t think we can. I’m going to leave this one open-ended; I have no answer or insight to pull it together. Our wines are simply too cheap, both here and abroad. But wine is a luxury and with the economy in dire straits and everyone scrambling to save money, this might not be the best time to consider being so bold as to start asking the local market to pay what it’s worth. At least we can get award winning wines for R35 a pop, so there’s that. Marthelize, really enjoying your contributions. Your passion for SA wine shines through. The sad thing about this wine is that the only link in the chain that made money from it is Ultra Liquors, and to be fair to them, it wouldn’t have been a lot. The fact that it is so good just illustrates what a challenge the larger industry faces. The equivalent of $US 2-25 retail is nowhere land. Guarantees growers going out of business, farm workers being caught in the ongoing cycle of poverty and an inability to reinvest on the part of many producers. It’s not a shot at Ultra Liquors either, just the insanity of the race to the bottom at the moment. Thank you so much for your comment – I’m always relieved (and pleased) to know that someone reads what I put out there – and delighted if they agree or approve. Your comments are spot on – I think Brand SA is still so far away from really cementing a foothold overseas (specifically USA) that we need to avoid the retail black hole of sub US$10 wines like the plague – not to mention run screaming from US$2-5 range. In my last piece I mentioned what happened to Australia with piggybacking high prices on bad wines which basically brought down the house of cards. I don’t think we’re in danger of quite doing that but it is something to be wary of – when I talk about raising prices I mean in a reasonable, systematic way (whatever that might translate to in practice) and not just piling on extra $$$ for the sake of it. Kudos to Ultra Liquors though – I don’t think many people saw that coming. Thanks for the heads up, Kwisp. I’m sending my agents to Parow and Goodwood tomorrow (we only have a 5 Ultra Liquors down in Cape Town, not like up in JHB where there are many – hopefully that means I get lucky! Update: My agents inform me all Ultra Liquors are out of stock (well, Parow, Goodwood and possibly also Green Point). Good post. Vinpro released a study a few years ago (3 years I think) where the average price of wine sold in SA was just below R30 per bottle. Of this, the grape grower was getting less than R1. As an industry, we talk about quality, but this is only sustainable if everyone in the chain gets a fair share. The reality of the SA wine market is that very little wine is sold above R50 per bottle, and to make money at R50, as well as pay your staff fairly, you have to have some level of economies of scale and be super efficient. The retailers need to start understanding this. To fall back on “that is where market is buying” is ridiculous. If lamb chops were sold at R20 a kilo, I would be buying lamb as my staple. Elsewhere on this site there is an article about a wine made from grapes in a vineyard that only has a yield of 2 tonnes per hectare. If the buyer of said grapes is not paying at east R20 000 per tonne, or he is not in a sustainable business. Everyone in the industry needs to focus on financial sustainability. Marthelize, I want to echo Grant’s words. Your articles are always worth a read and full of food for thought. Breinkos! First of all, I am delighted that such a cheap wine has won so many accolades, as it really puts the finger up to all the “it is so expensive, it must be good” snobs out there. I have been perusing Cape wine prices recently and it is disturbing to see how many new (avant garde?) producers with little track record, are asking excessive prices for their wines, when compared to producers with a well-proven track record. These days it seems that everyone with a barrel of something in the garage and a funky label, can charge R200+ for their wine. Examples are too many to name, but I think you catch my drift. Secondly, in terms of internationally pricing, one must remember that our wines are slaves to the exchange rate. And, though the weak Rand, is nominally good for exports, it is not great for bringing our export wine prices on par. Should the Rand strengthen dramatically (unlikely! ), half of the problem is solved. Relevant read as always Marthelize! I was in the USA a few weeks ago and as always had a good look around the wine shops. Sadly very little Cape wines on the shelves and judging by their vintages not flying off the shelves despite low prices. The problem with low priced wines in the US is this: buyers of cheap wines buy them at supermarkets and big liquor discount boxes. Those cheap wines come from huge volume producers with the volume and marketing support to supply the big chains there. Consumers of cheap wins don’t go shopping in the wine stores. The folks who shop at wine stores are generally more educated or well-off wine shoppers and they buy mid to upper priced wines. I had to buy some wine for dinner with friends there and was confronted by huge lot of wines I did not know. Buying cheap there felt like high risk, the expensive wines were too expensive, so the mid priced wines felt like safest bet. But $24 wine on shelf – say good Sauv Blanc – means FOB price of $6.85 given typical 3.5X retail price multiplier on imported wines in US. Thats about R100 and few Cape Sauv Blancs even retail for that here! Importers expect to buy their wines at a reasonable discount to SA retail and that is where the chicken and egg comes from. In SA we cant get retail prices high enough to get to a say R100 FOB price for Sauv Blanc. So it means that producers who establish a decent foothold in such market may have to decide if its worth selling in the local market or best to focus on the export markets. Thats a high risk strategy though… Lots of factors outside of your control! Incidentally, the point that Grant makes was also made by Michael Fridjhon at his “Masterclass”. Mark Norrish of Ultra did tell me that the producer’s own-label version of this wine sold for very little more than this – so there’s no question of the producer being screwed by the retailer here. But yes, as everyone keeps saying, prices for good grapes are way too low for the health of the industry. So glad you enjoyed it. My original phrasing was “snobbish outrage” – specifically to refer to wine snobs who don’t really know much about wine and are of the “it’s expensive so it must be excellent” clan. Christian did some editing there, so perhaps my meaning got lost but it’s not exactly a key issue in the piece. And the discussions I’ve been part of have – curiously for me – all been off Twitter, actually. Less connoisseurs but lots of wine industry people (I work with a lot of tasting rooms, sales & marketing people etc. and I’ve been gathering some interesting comments). Just remember that to make money in this business one needs to sell the wine. All those high asking prices for avant garde wines does not necessarily result in “sold out”. I supect that this R35 wine is one of the non sold out wines and it will be a never to be repeated offer. So bear in mind this R35 Chenin was quite probably on offer under the intended label at a much higher price. Just want to refer you to Tim’s comment – he confirms that the estate didn’t sell the wine for much more than Ultra does, so in this case it’s not like we’re looking at a R100 chenin that got cut down savagely by the retailer, which is important because it reiterates the level of quality we can punch out at ridiculously low costs. And re ‘avant garde’ wines – and I’ve said this before – even if we sell every single bottle of all our unique, award-winning, 95+ Parker points scoring, ultra premium wines (be it the likes of Sadie, Mullineux or Rubicon, Paul Sauer etc.) to a single overseas market (e.g. US) the total volumes probably won’t be enough to make a dent or change in the market. We need to focus on the mid-tier which offers both the quality and value for money while it probably gives us enough wiggle room to raise the prices without it being a problem.